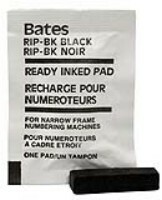 Ready-Inked Pad, For Standard and Dropped Cipher Numbering Machines, Black. Pre-inked or Dry Pads inserts easily. For standard and dropped cipher numbering machines, all sold separately. Refill for consecutive numbering machines.